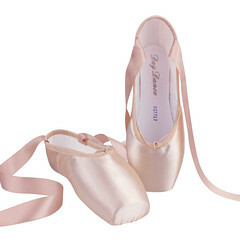 Do you know what is just as interesting as finding a new brand of pointe shoe? Learning that manufacturers have been alive and well making ballet shoes for decades and decades without any knowledge on our part. 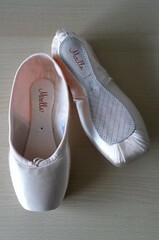 I have so much admiration for the craft of handmade ballet shoes. I love finding those hidden gems of makers that have passed on the tradition to their children and grandchildren. It all started in the small town of Gorgonzola, Italy, a small area of Milan. The company was established in 1915 by a craftsman named Agostino Beretta. You can see a picture of him at age 70 here. The company was known as Beretta at that time. During World War II, Mr. Beretta was reduced to repairing shoes until better times could come along. 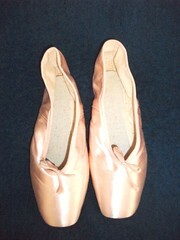 Between 1960 and 1967, the company grew to export ballet shoes to many countries like England, Holland and Africa. In 1967, Mr. Beretta’s daughter Tina joined the business. From there, her son Colombo Fabio took the reins in 1989. Agostino died in 1977. He left a lasting legacy with his contribution to the performing arts. His dedication to crafting quality dancing shoes by hand is something every ballet lover can admire and respect. 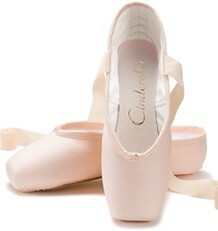 449-For beginners as a first pointe shoe. 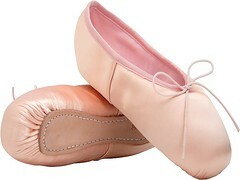 Made with a softer box, reinforced wings and more flexible soles. 450-For professionals with a hard toe box and medium-strength shank. 451-For professionals with a hard toe box and hard shanks. 452-For professionals with extra-hard shanks. 453-For professionals with a softer shank and more flexibility. 455-Professional model with carbon sole insert for strength and flexibility. This is their newest model. They come in six colors; pink, salmon pink, white, black, red and blue. You can view the sales and specifications page here. It is in Italian, but that is molto bene if you enjoy looking at belle scarpe da punta. Sadly, I couldn’t locate the company on any social media sites. There are no company Facebook or Twitter accounts that I know of. Their official website link is Colomboitalia.xoom.it. 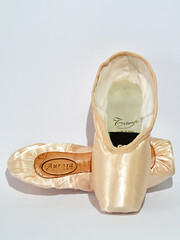 This entry was posted in Italian Brands and tagged Agostino Beretta, Colombo Fabio, Colombo pointe shoes, Italian pointe shoe brands, pointe shoes made in Italy. Bookmark the permalink. 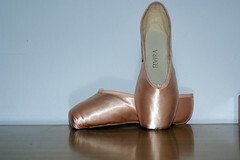 I have never heard of these pointe shoes – how very interesting. I love hearing about “grand masters” who have passed on their knowledge and experience to the next generation. It keeps to use your words Classical Ballet alive.